Rep. Tom Demmer receives the 2018 Legislator of the Year Award from the Community Behavioral Healthcare Association at the CBHA annual conference. He is shown here with CBHA CEO Marvin Lindsey and Sinnissippi Centers, Inc. President and CEO Patrick Phelan. 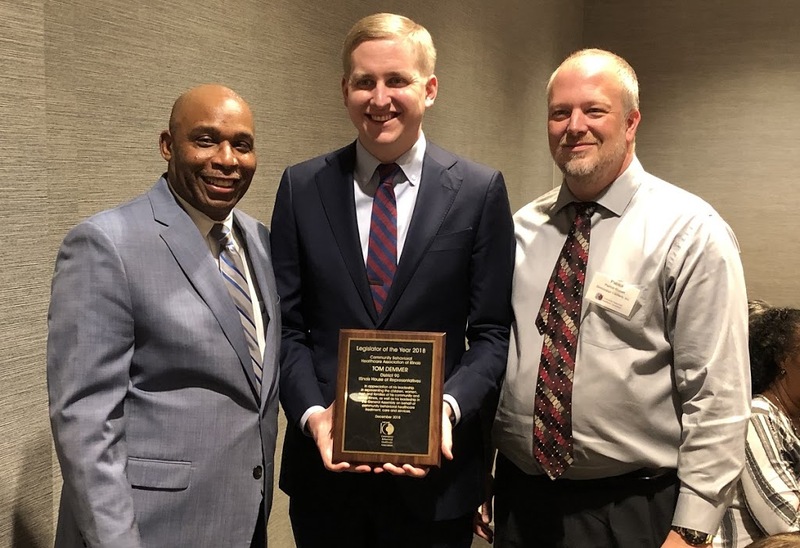 In recognition of his advocacy on behalf of some of Illinois’ most vulnerable residents, State Representative Tom Demmer (R-Dixon) has been named Legislator of the Year by the Community Behavioral Healthcare Association (CBHA) of Illinois. Demmer was nominated for the award by the staff and administration of Sinnissippi Centers, Inc., a community-based behavioral healthcare system in Northwest Illinois. In Springfield, Demmer serves as the Republican Spokesperson for the Appropriations- Human Services, Healthcare Availability & Access, Human Services, and Mental Health Committees.